Dance students from Middlesex University have been working on a series of exciting projects in collaboration with the Royal Air Force Museum. Combining the Dance at the Museum partnership with the Dance Department’s Primary Partnerships project, Middlesex students created original performance pieces with pupils from Sunnyfields Primary School. Final year BA Dance Performance students Sophie Cragg and Jordan Grigg worked with 14 children to create a dance performance entitled Our Wings of Love. The children performed at the Barnet Schools Dance Festival on 10 March and at the RAF Museum on 29 March and 25 April. Our Wings of Love has been captured in a film created by Middlesex University media students Oar Abbi Williams, Francesco Zoffoli and Carlos Da Silver. The film will be on display in the Wings of Love exhibition room at the RAF Museum until early next year. Deputy Headteacher of Sunnyfields Primary School Ann Richards believes the school’s partnership with Middlesex is a valuable one for pupils. “The partnership enabled our year four, five and six children to create a high quality dance, while developing their skills in creative movement,” she says. The Dance at the Museum partnership also offered Middlesex dance students the opportunity to create and perform their own work specifically designed for the Museum’s site and history. April Brown, Associate Lecturer in Choreography at Middlesex, says partnerships like Dance at the Museum are extremely valuable for students’ future career progression. “Creating work for such a prestigious venue is a fantastic opportunity for our students,” she says. This year Graduate Academic Assistant Christina Binney worked collaboratively with 14 undergraduate dance students on a performance entitled Behind Every Brave, inspired by women’s shared sacrifice of sending their beloved men to war. Third year BA Dance Studies student Amy Frankham also created a piece at the Museum as part of her final choreography assessment. “My understanding of how an environment like the exhibition space can be transformed for performance has developed,” she says. 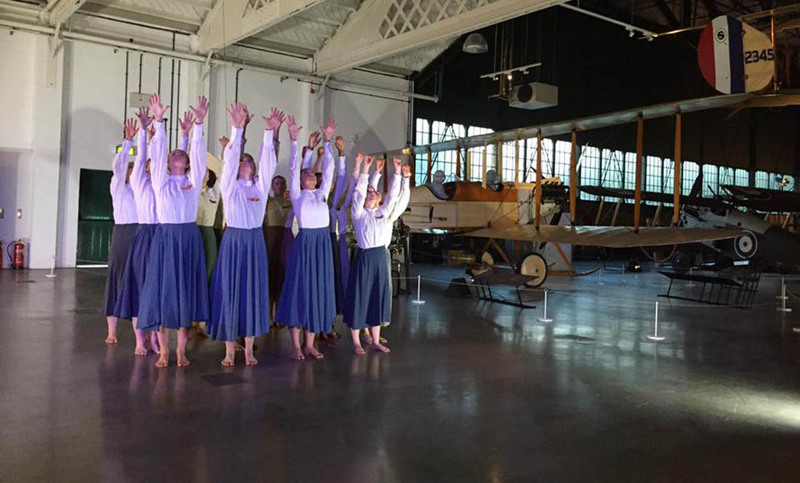 Free public performances of the Dance at the Museum work will be taking place on 20 and 21 May at 12.30pm and 2.30pm in the World War One in the Air exhibit.